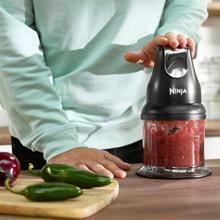 The Ninja Professional Stackable Chopper is a handy, portable solution that takes all of the hard work out of food prep. This compact, yet powerful device allows you to precisely chop and prepare ingredients in a matter of seconds. Complete with two sealable containers, one Ninja blade and blending power pod for the safe, quick and simple chopping of ingredients, no matter where you are in the kitchen or how much space you have to work with. 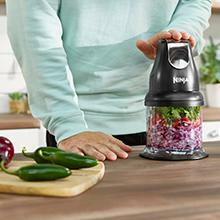 Whether chopping, grinding or blending delicious sauces, all you need to do is place the blade in the cup, add the pod on top and pulse, it really is that simple. Made too much? Not a problem for the NINJA Prep as each pack comes with handy lids to place directly on the blending bowl and refrigerate keeping your creations fresher for longer. Struggling for storage space? The cups are designed for stacking so there’s always room for your Ninja Chopper. We’ve also made cleaning easier with all removable parts dishwasher safe. 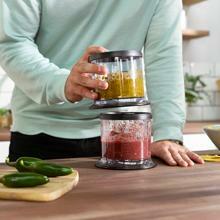 Ninja Professional stackable chopper, prep made easy! Simple pulse action to Chop, Mince and Puree with precision and ease. Includes 2 stackable containers with lids, perfect for storage in the fridge or cupboards. Pulse action to Chop, Mince, Puree with precision and ease. No more mush with controlled and consistent chopping courtesy of Ninja blade technology. Stackable containers with lids, perfect for storage in the fridge or cupboards. Easy preparation inspired by the Quick Recipe guide included in the box.